I've pretty much always had long hair. Not to mention I've also always had incredibly thick hair. It might not look that way, but every time I sit down in a hairdresser, they go "wow, you have a lot of hair!" But they also always tell me how healthy my hair is too, so woohoo for me! 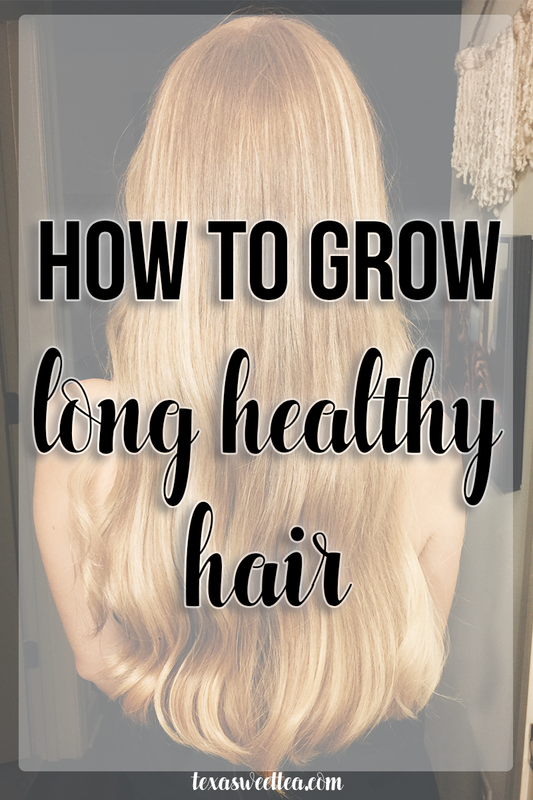 I thought that I would share some of my secrets of how to grow/maintain long and healthy hair. It can be hard in a world full of highlights, straighteners, curlers, blow dryers...the list could keep going, but you get the point. I rarely use any heat on my hair. Usually it's only during sorority recruitment when I pull out the straightener and blowdryer. I know that can be hard for a lot of people to just let their hair air dry because it can get all frizzy or curl a way you don't necessarily like. But if you plan on straightening it anyways, why not just let it dry naturally? That way you can avoid using double the amount of heat on your precious locks. Another recommendation to use less heat is to find heatless hairstyles! Pinterest has so many different tips and tricks for this. Whether you have long hair or short, there are tons of hairstyles for you to pick from. Maybe start out by doing one or two a week if you're the type of girl who always has a heat tool in her hand. You'll be surprised at how much time you can save just putting your hair in a braid and bun instead of curling your whole head. I actually just started doing this in the past year and I notice a huge difference in the strength of my hair (and also nails). Since I'm a vegan, I do take a B12 supplement. I just pop it under my tongue right after I brush my teeth. That's personally the only vitamin I take, but I have been loving the way it makes me feel! I've heard of a lot of people taking fish oil pills to help with hair growth. If you are interested in taking them, please do your research! There have been studies that show it can increase your risk of breast cancer and prostate cancer. Clearly, I'm no professional, but if you're eating a healthy balanced diet (which I personally believe is a plant-based one, but that decision is up to you and what makes your body feel best), then you shouldn't need to take a lot of pills. Like I said, do some research and find out which vitamins can help benefit your body! So many girls I know take hot showers every. single. day. Not only does can this cause your hair to become oiler, but it's not necessary! I know the girl who showers every day is rolling her eyes at me right now, but you can train your hair so that you don't have to shower every day. If you're lucky enough to have summer break or winter break, then use that free time to shower less. Push through the oily hair! I usually shower every 3 days or every other day depending on the time of year. If you're a really sweaty person, then you can obviously take a body shower every day, but consider investing in a shower cap. I sound like a crazy person right now, but I promise it works! Don't strip all of the natural oils out of your hair. Just because I have long healthy hair doesn't mean I don't get split ends. Whenever I notice that my hair is looking a little "meh", I'll go get a much-needed chop. Sometimes I'll cry about it (who hasn't cried about a haircut though), but honestly, my hair grows pretty quickly. 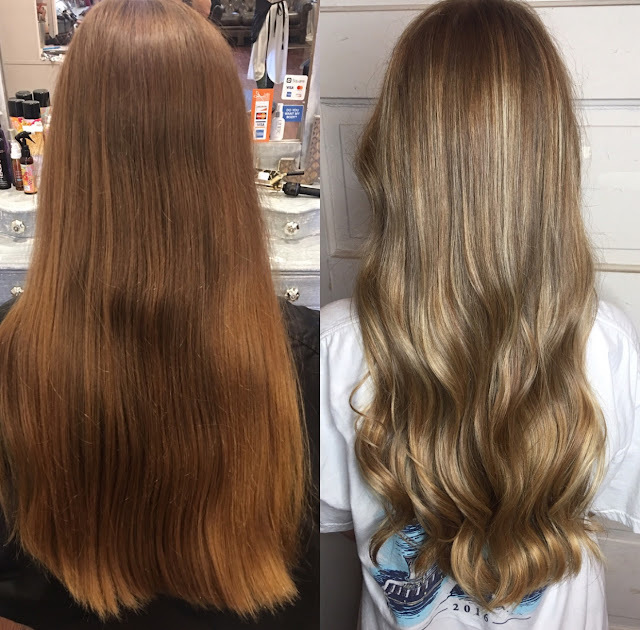 I'm dramatic, but I always know that it's worth it to have my hair look healthier. Treat yo'self and your hair once a week by using some sort of treatment. There are tons on the market, but I really like using a hair mask and then just taking my regular shower right after. I'll link some of my favorite products down below, so if you're in the market for some new goodies, I've got you covered. Also, take a peek at the ingredients in your shampoos and conditioners. Sulfates can actually strip the natural oils out of your hair, and why would you want that? I made the switch to sulfate-free and I've found that my hair is a lot softer! Please don't buy into the BS of products saying your hair will grow long overnight. It takes time to have your hair grow, especially if it's really damaged. Just be patient because honestly, there's nothing else you can do! Your hair will thank you, and reward you with luscious locks in no time. Here's also a picture of my hair that I recently got balayage. It shows off how long my hair is! I wish my hair was as long as yours! My hair is fine so my pony tails look like I'm in the 3rd grade lol. Oh no! I always used to wish my hair was thinner because it takes so long to dry. But I guess everyone wants the opposite of what they have!